Although I share most of my fashion on Facebook and Instagram, I am soon going to be bringing back style posts to the blog. Because I'm still and will always be a huge fan of fashion, I was intrigued when ModCloth reached out to me to see if I was interested in participating in their Uniquely You campaign. The campaign involves creating an outfit based around one chosen piece from ModCloth. 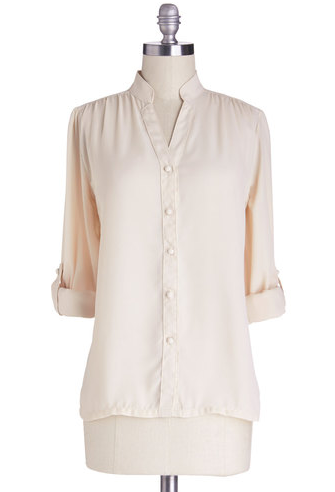 This week's chosen piece is their Grand Tour Guide Top. When I first saw this top, I immediately thought it could be dressed up or down, which is a great quality in a fashion find. I decided to incorporate it into a work outfit. I am a strong believer in being workplace chic. I love to incorporate color and patterns into my work attire to show some of my personality. I created the outfit below on Polyvore. This outfit contains color, patterns and simplicity, which is great for work. Also, all of the pieces could be worn to jazz up other outfits and mix and match. I love it! What do you think? Do you play around with color and patterns with your work attire? I received no compensation for this post. These are my own personal ideas and creations. I really love this top! I love pieces that can be casual or dressy. I always find myself clinging to pieces that I can wear either to work or out on the town. And I LOVE ModCloth. I don't own anything from them (yet), but I sure do do a lot of virtual window shopping on their site! Visiting for the Southern Girl Bloggers Group! So happy to have found your blog! Great color palette! I love, love, LOVE that blouse and those earings!! Gorgeous outfit. I love pieces like this! You can dress them up or down. Fun! Thanks Heather! I really appreciate you stopping by! Thanks Tiffany! You sound like me. I cyber stalk their website but have yet to make a purchase. LOL. I really appreciate you stopping by!